B9Creator’s Support forum, home of learning and help with B9, has undergone some ‘under the hood’, or ‘back end’ updating of its forum software. The update provides many new features for users, a new design, but will require registered users to get a new password. Simply login with current credentials, and from the login failure page, click on ‘forgot password’ and a new one will be sent to your email address. Explore the new features and settings in your account settings and profile, and enjoy your enhanced learning and support! Read 12 reviews and see the stats on B9Creator (incorrectly listed as of today with 50µm layer thickness minimum, we’ve reported 5µm as the correct number) and the rest. Mike Joyce explains on the B9Creator forums how to define a 1:1 Red-Cherry B9Creations resin mix in the Materials Catalog, making it easier to select when printing. Jewellery makers on the forum rave about the results they get and speed of printing with 1:1 at 30µm xyz. Try it out! Based on the 1.7.3 software on a v1.2 B9Creator HD, there are a number of interesting comments and photos in the Topic. We’re set it up and will be trying a print soon. Contact us via web form or phone with your queries. 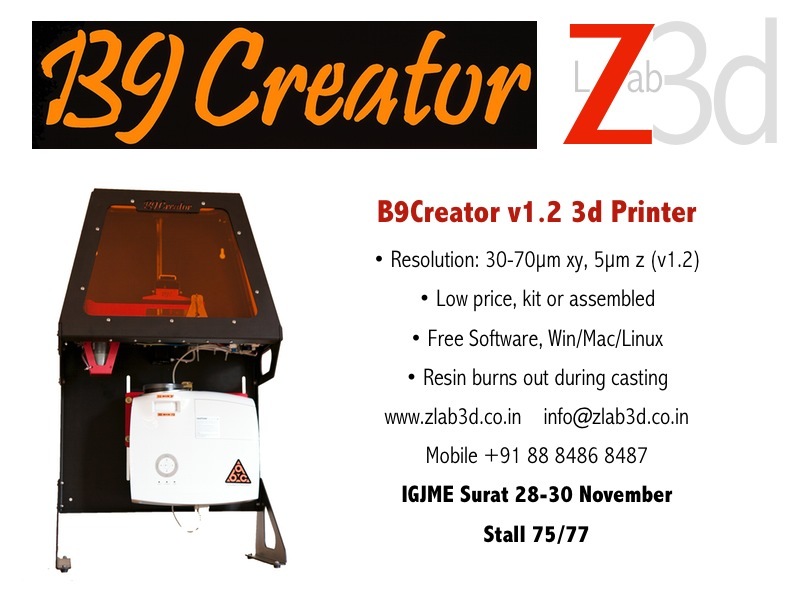 B9Creator at IGJME 28-30 Nov.
Visit Stall 75/77 to see B9Creator, ask for the MJSA 3D printing table, see our sample prints and ring-in-a-sphere. Check out coverage by Jewellery Technology & Machinery magazine! See and talk with us about B9Creator at Stalls 75-77 at the India Gem & Jewellery Machinery Expo 28-30 November at the Surat International Exhibition and Convention Center in Sarsana, Surat! The new and empowering solution for Indian jewellers’ RPT CAM needs at a fraction of the price of more famous machines. Consumables are affordable, limited training and support are provided by KNS right here in India. Know More, visit us at Stalls 75-77! Our latest shipment of B9Creator HD printers has arrived and we have stock available! If you’re holding a quotation, please complete your neft. We distribute in order of payment received. Assembly assistance is provided here at our training centre in Bangalore if you’d like to save and purchase the kit version, returning to your facility with the assembled machine. Contact Us for a quotation if you’d like assistance at your facility (it will be expensive). Really, it’s simple enough (and more cost effective) to follow the free pictorial pdf guides downloadable from B9Creator.com. Download the Kit Assembly Instructions v1.2 and see for yourself, then decide. As an open-source product, the B9Creator software can be freely downloaded and used any time. We encourage you to send both technically correct stl files for sample printing as well as Job files you create in the B9 software. Getting a taste of B9’s ease of use on Windows, Mac, and Linux will give you a better idea of how well it can work for you. So go ahead, download it, create a new Layout, Add stl(s) to the Layout, add Supports, Slice, and send the .b9j file to us for printing! For those of you holding quotations for B9Creator printers or resins, just to let you know, we’ll have fresh stock soon, as both are on the way. We do have resins in stock now, for your immediate need, as well. So please confirm your orders soon and there will be little delay in getting your new materials. Jewellery manufacturers are using B9Creator in India and getting satisfaction with the results. As soon as they let us share their success, we’ll post about it. The always-free B9Creator software has been updated by Mike Joyce to 1.7.3, and includes a firmware update. As always, update the firmware from the installation software itself, not the Internet if Windows prompts you to do that. Pay attention to the details as some things of significance may have changed, depending on your circumstances. Knowledge is power. Download the update for Windows, Mac*, Linux. – Fixed a Mac issue that would allow the grid pattern to move to the wrong area during print when the status dialog moved. – Fixed Printer Configuration Communication issue with linux machines. – Print Preview Scrolling should now be smoother. – Fixed an issue with the serial port library that was causing random lost comm errors!!! Double click the .dmg file, drag the B9Creator app icon to your Applications folder, and launch it. If your System Preferences > Security & Privacy > General tab (in Mavericks) is set to anything but “Anywhere”, you’ll get a window indicating B9Creator can’t be opened since it’s from an unidentified developer (well, WE all know Mike Joyce). In this case, simply click the Open Anyway button and B9Creator will launch.